This little book has been sitting on the shelf in the kitchen for a while now waiting for someone to feel like embarking on a culinary adventure. Around about lunchtime today Adam declared that he was going to cook an Anglo-Saxon feast for dinner. So he did (with the odd anachronism thrown in). 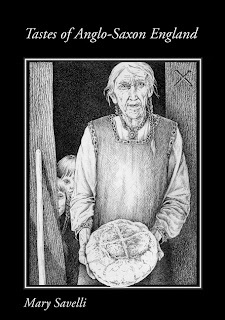 These 46 easy to follow recipes will enable you to enjoy a mix of ingredients and flavours that were widely known in Anglo-Saxon England but are rarely experienced today. In addition to the recipes, there is background information about households and cooking techniques. 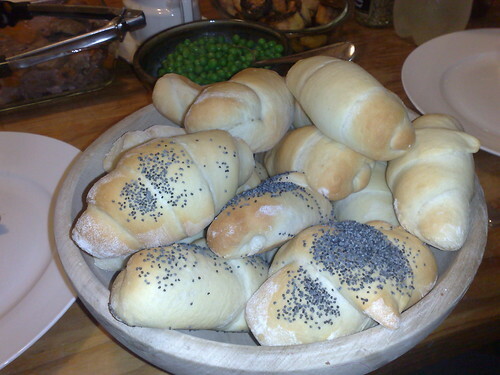 Adam decided against wrestling with a new bread recipe and went with the dinner rolls recipe he’d used just recently. This time I have a photo. Tom helped cook them and was therefore convinced that he should be able to eat as many as he wanted – I think he scored three in the end. Our main course was Bræde Sceapen Flæsc, otherwise known as Lamb Roast. 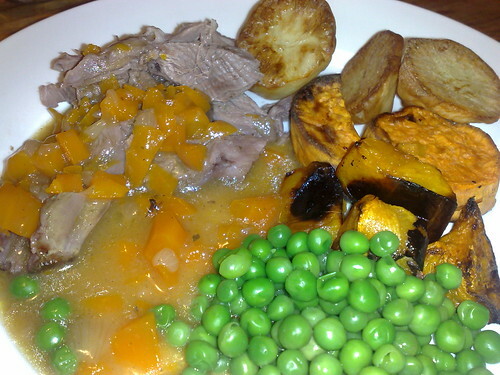 The leg of lamb was placed in a baking dish with a mix of chopped carrots and onions, stock, cider, flour, ground coriander seeds and dried sage leaves poured over it. It was then covered and slow baked, resulting in tender meat in an absolutely scrumptious gravy – the fat content of which we will not be thinking about! 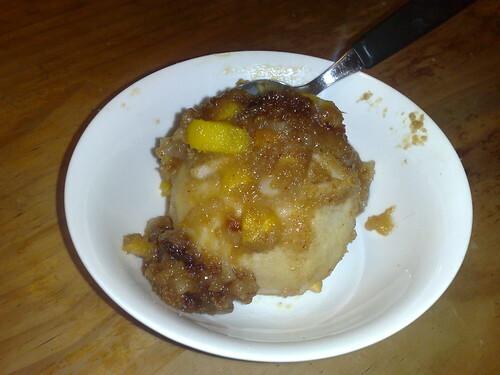 Dessert was Bæcen Æpplas (Baked Apples). Cored and peeled apples were stuffed with chopped pear and peach, breadcrumbs, cinnamon, butter and honey and baked till the filling was cooked and bubbly. They weren’t particularly photogenic but they were utterly delicious. And, just because cooking three things at once wasn’t enough for him, Adam also made Æpplas Syfling (Apple Butter) with honey, pepper, mint and cumin. We tried some on the bread rolls, rather nice but VERY sweet. Adam is welcome to cook me an Anglo-Saxon feast! That looks amazing. Very hungry now… Well done Adam! Brilliant, and I so want that book. I love thinking about what people used in eat in Britain before they got all those tomatoes and potatoes. That apple butter is screaming 'pancakes, pancakes' to me. 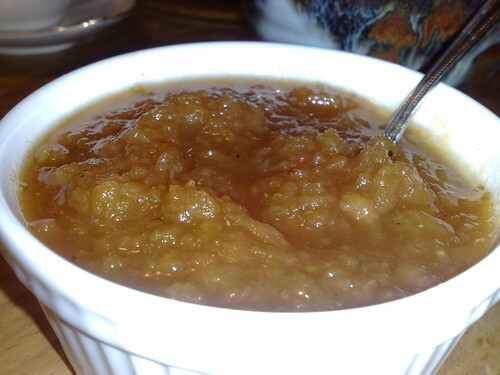 Wow…the apple butter looks super yummy!! Al the food looks great, but me, I am a bread girl and those rolls are calling me. I'm not surprised that Tom was really full and I am really impressed with Adam too. What a great man you have! Mim, you're killing me with pictures of that food! What a feast. Way to go Adam…may I come over for your next such dinner? oh my that all looks so delicious….i have to bookmark it on my food blog and cook it up….it's definitely my kind of dinner! I hope you do more…how do you get Tom to cook, my hubby is a master chef (at least he says he is) but he just never gets it together to actually cook! Eh, I don't "get" Adam to cook, he does it all by himself – Tom's the 8 yr old 😉 Today he has a loaf of rye bread underway and is marinating a pork roast using a recipe from the same book. Plus I believe there are plans for pears poached in red wine for dessert! I presume the novelty will wear off eventually and he'll go back to being our breakfast chef.